Click any project photo to view more details about the Hurricanes of 2004. Then, use the navigation tools at the bottom to view other projects. Surface Area: 20,000 sq. ft. Surface Area: 4,000 sq. ft. Qualities of an SPF roof Rugged: Rigid SPF exhibits superior compressive strength and provides excellent resistance to mechanical damage from outside elements. Seamless: Because SPF is self-adhering and sprayed in place, there are no seams, channels, complex flashings or overlapping edges for water to seep through. The product keeps liquid water out, but allows water vapor to escape so that there are no moisture traps in the building. Weather Resistant: SPF roof systems provide the best possible protection from the elements. This roof system evenly disperses precipitation and ice in the winter and enhances evaporation in the summer. 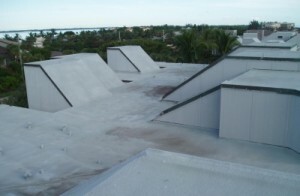 Wind up-lift resistance: Properly applied, an SPF roof creates a chemical bond with the surface to which it is applied creating a tight “bite” into the steel deck. This eliminates the possibility of SPF separating from the deck as there are no opportunities for the wind to penetrate underneath. 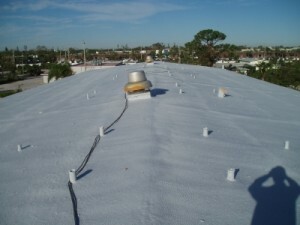 These roofs do extremely well in hurricanes, as noted regularly by our customers. To review testimonials, click here. Low Maintenance: All these factors and more combine to make SPF the easiest system to maintain. 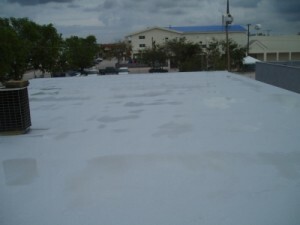 With proper installation, an SPF roof will last indefinitely with periodic renewal of the coating. The cost of recoating an SPF roof every 8-10 years over a thirty-year period comes out to a fraction of the cost of maintaining or replacing most conventional systems.Green: SPF roofs improve indoor air quality, produce no HCFCs or CFCs, and provide the highest insulating value in the industry. Highly Energy Efficient: An SPF roof system is the most energy efficient roof available. SPF has over one million closed cells per square inch, and amounts to a value of R-6.5 per inch. This reflects significant lower energy costs.